Humana Medicare Supplement Plans are Medicare Supplemental policies offered by Humana, a health insurer established in 1961, has increased their footprint to become one of the largest publicly owned health insurers in the United States. Compare rates for all the companies offering Medicare Supplement Plans in your area or call 844-528-8685 to speak to us. Continue reading for details on Medicare Supplement plans offered by Humana. Although most seniors know ahead of time, there is a certain amount of sticker shock when they first enroll in and use Medicare Part A and Part B. Please don’t misunderstand, the sticker shock is not for the monthly premium being charged for Part B, the sticker shock is from the substantial gaps in coverage that result in significant out-of-pocket expenses because of deductibles, copays, and coinsurance. Fortunately for America’s seniors, the private insurance industry saw an opportunity and began offering supplemental insurance that would help mitigate out-of-pocket expenses in return for an affordable monthly premium. 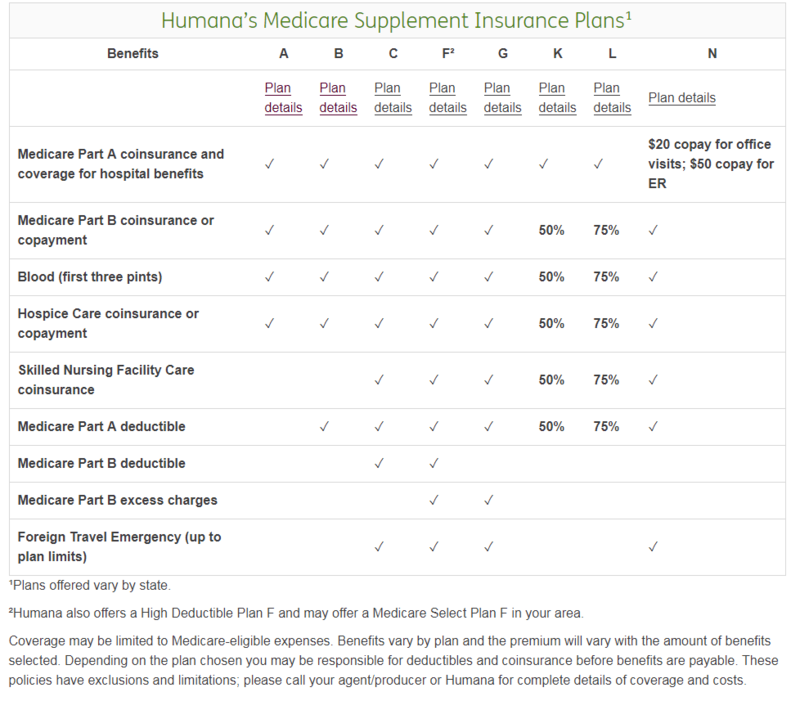 We should point out, however, that the premium for Humana Medicare Supplement Plans is in addition to the Part B premium and not in lieu of it. Simply put, Medicare Supplement insurance fills in the gaps of Original Medicare, hence the term Medigap. The coverage experts on the Medicare Solutions Team intend to educate those seniors who are significantly concerned about these out-of-pocket expenses and provide solutions for how to get them under control while paying as little additional premium as possible. We accomplish this by helping seniors shop their coverage with all of the highly-rated health insurers that offer Medicare Supplement Plans. The good news is, we never charge a client for providing this valuable service. We enjoy our relationship with Humana since they are a leader in the health insurance marketplace and we are confident every year that they will offer competitive pricing along with outstanding customer service. Currently, Human is serving over 14 million medical members and over 7 million specialty members. Headquartered in Kentucky, Humana continues to receive accolades for its health insurance products as well as their outstanding customer service. To drill down into your insurer's financial stability and an outlook for the future, several national rating services spend the time needed to investigate each company's balance sheet and P&L statements. Certainly, these high ratings from the national services can be attributed to Humana's stellar results in 2017 with revenues north of $53 billion and assets valued north of $27 billion. Insurance plans for military members, retirees, and their families. Like most health insurers, Humana offers all of the most popular Medicare Supplement Plans which include plan A, B, C, F, High Deductible F, G, K, L, and N.
Medicare requires that companies who offer Medicare Supplement Insurance offer the same required minimum coverages which means that the primary difference between each company is the price of their plans. Renewable Coverage – Once you’re qualified for a Humana Medicare Supplement plan, your insurability continues. This means that if you become ill or hospitalized in the future, the company guarantees to renew your policy year after year. Trial Offer – All of Humana’s Medicare Supplement plans come with a 30-day free look period. This means that if during your first month of coverage, you decide the plan is not the best choice for you, you are entitled to a complete and full refund of any premiums paid to Humana. Portability – Your Humana Medicare Supplement plan is portable. This means that your plan’s coverage follows you anywhere in the country and your plan will be accepted by any medical provider or facility that accepts Medicare. Auto-Pay Discount – Insureds who elect to have their monthly payments electronically deducted from their checking account or a credit card will receive an additional discount on their payment. Electronic Claims – Although most healthcare providers will file your claims directly with Humana, you can file a claim through their website when necessary. Medigap plan A and B are considered basic plans are the least expensive in terms of monthly premium. Although A and Medicare Supplement plan B provide many of the same medical and hospital benefits as more expensive plans, Plan A will not cover your Part A and B deductible and B will not cover your Part B deductible. Plan C should be considered because although it's priced a little higher than A and B, the plan offers more coverage than the basic benefits which offers peace of mind knowing that your medical needs will be covered. Please note that the Medicare Supplement Plan C is limited to Medicare-approved charges only so you may have out-of-pocket costs if your healthcare provider charges more than what Medicare allows. Plan F and Medigap G are very popular because both plans will cover Medicare Part B excess charges. These are charges that your healthcare professionals invoice for but are over and above what Medicare has approved to pay. Plan F also offers a “High Deductible” option where the insured trades a lower monthly premium for additional out-of-pocket expenses. Plans K, L, and N are designed to provide the basic benefits as the other Medicare Supplement plans at a lower premium in exchange for the insured accepting a lower coverage amount of Original Medicare’s coinsurance and copayments. Plan K and L do offer a cap on out-of-pocket expenses. Medicare Supplement Plan N offers more coverage that K and L while still reducing the monthly premiums and the only out-of-pocket expenses are it’s $20 copay for doctor visits and it’s $50 copay for emergency room visits. Silver Sneakers – A paid membership to a basic fitness center. Vision Discount Card – Members automatically become a member of EyeMed which offers significant discounts on vision services at many national vision centers. RX Discount – The RX Discount program allows members to save an average of 20% on medications.